Click on any image for more information and additional photos. Exceptionally rare example with raised relief carved wings in nearly mint original condition. Just a minor bit of paint touchup of the filler around the neck seam (not a crack; Boyd made this one like his herons with an attached 2-piece head and body). I have only seen another Boyd cormorant, a matched standing pair purchased 12 years ago at auction for $13.5K. I like the attitude of this one better because it looks more like a feeding cormorant. 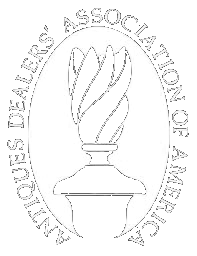 6 1/2” long x 4 ½” high. Rare species in fine original condition. Very minor paint crazing on back and a few tiny rubs. First example I have offered! From a fresh to the market collection of George Boyd miniatures we just acquired. See Jim Cullen's "Finely Carved & Nicely Painted" book about George Boyd, page 82, for a similar example. Unusual example with head turned 45 degrees to the left (few Boyd miniatures have turned heads). Excellent original condition. Just a couple of fine paint shrinkage spots on its back. See Jim Cullen's "Finely Carved & Nicely Painted" book about George Boyd, page 80, for a similar example. Exceptional original condition. With its original padded velvet pin cushion "saddle". Thread spool spindles have been removed. Boyd made these exclusively for the women in his immediate family. Six geese and a goldeneye are known. See Jim Cullen's book about George Boyd, "Finely Carved and Fancy Painted", page 50. This 16-page soft cover folio is the definitive study on this famous New Hampshire carver. It was published in 1978 by Win Carter and Ray Egan, and is illustrated in color and black & white. Very few copies remain. This one is signed by Egan and is mint. 10" wide x 8" high. This book is thoroughly researched and beautifully illustrated in color. 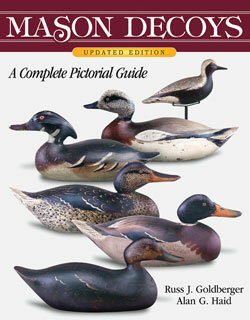 It covers Boyd's working decoys and his incredible variety of miniature bird carvings. This is a first edition from a printing of 500 copies.